Dry mix is packaged in 55 lb (24.94 kg) bags and the liquid polymer is packaged in 5 gallon (18.9L) pails. 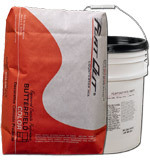 One pail of polymer yields enough material for approximately 6 bags of countertop mix. One bag of dry materials mixed with approximately 3.25 quarts (3L) of liquid polymer yields 0.42 cubic feet (11.9L) of cured material or approximately 5 square feet (.46 m²) at 1 inch (25.4 mm) thick. SureCrete’s XS Precast is a easy to use, dual component precast concrete countertop kit that greatly reduces the materials and labor required to construct traditional precast concrete such as concrete countertops. No reinforcement steel is required, thinner precast pieces are routine, and quicker production times are accomplished. A stronger, denser and more flexible cementitious composite is created by combining cutting-edge technology with modern fiber advancements. With a wide range of coloring and texture selections along with the addition of optional aggregate loading (up to 10 lbs per bag) design considerations are nearly limitless. XS Precast produces concrete countertops, fireplace mantles and facades, shower surrounds, wall panels, furniture and many other architectural elements. XS Precast is the perfect medium for residential, commercial, and industrial applications. 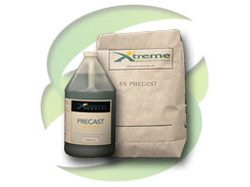 XS Precast is much more user-friendly than other concrete casting mixes. With very little “extra procedures” needed to accomplish beautiful and sound concrete countertops, XS Precast mix can be used by anyone, whether you are a do-it-yourself homeowner looking to improve your patio or outdoor kitchen or a seasoned concrete casting professional. We think everyone is entitled to a beautiful kitchen concrete countertop or bath vanity, so if you’ve got the time, we’ll help you design you counter or vanity at a fraction of the cost of typical granite or silestone pieces.